Domestic sheep are hooved mammals with woolly coats. Closely related to goats, they are ruminants, or animals that chew their cud. Domestic sheep are descended from European and Asian wild mouflon. People have raised sheep for about 10,000 years. More than 200 breeds exist today. Sheep are grazing herbivores, eating grasses, weeds, herbs, and shrubs. On farms, they typically also eat corn, oats, barley, and wheat. Sheep are able to survive with only minimal water supplies but must have some salt in their diets. Sheep live on all continents except Antarctica, with heaviest concentrations in Australia, New Zealand, South and Central America, and the United Kingdom. Wherever they live, sheep adapt to their surroundings. Shetland sheep, for example, are a hardy breed, well suited to the rugged Shetland Islands of Northeastern Scotland. Sheep are social animals that live in flocks. Sheep flocks tend to move all together, either led by a dominant sheep, a herder, or herd dog. When not grazing, sheep chew their cud—the process of re-chewing food that has already been partially digested. Domestic sheep are highly prized by people for their meat, fleece, and milk. Sheep are not in danger of extinction. However, some breeds, including Shetland sheep, are rare or endangered. 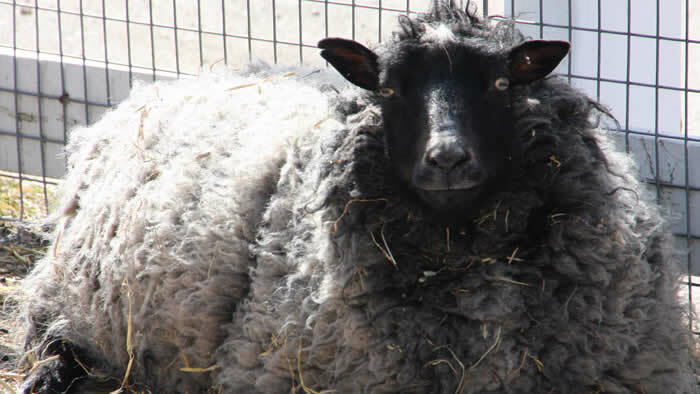 The Shetland sheep flock at the Wells Fargo Family Farm reflects the Zoo’s commitment to rare and endangered animals. Lamb: male or female, from birth to 12 months. Also, the meat of a young sheep. Weight: 100 – 400 lbs. A small flock of domestic sheep lives at the Goat & Sheep Barn. 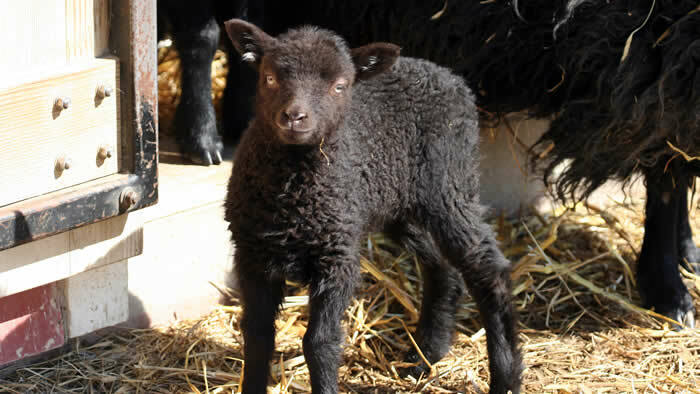 When the Wells Fargo Family Farm is open, visitors can pet and feed newborns and other lambs. 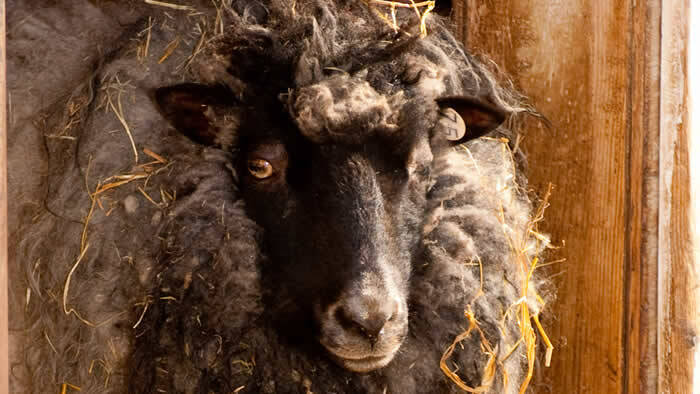 The Zoo’s flock consists entirely of rare Shetland sheep. These are relatively small sheep with colorful, full woolly coats. Rams (males) have spiral horns, while ewes (females) have no horns at all. The Goat & Sheep Barn is a red-walled, green-roofed building with a fenced area for sheep to enjoy the fresh air outdoors. Inside the barn, there is a lambing pen for ewes and a kidding pen for female goats. There is also a ram pen for male sheep and a billy pen for male goats. Lambs are cared for from birth. Inside the Goat & Sheep Barn, lambs are born in a lambing pen, a warm, safe place for a ewe and her babies. Sheep usually breed from early fall to midwinter, so lambing (giving birth) most often occurs in spring. Gestation (pregnancy) lasts about 148 days, or nearly 5 months. Single and twin births are common. Newborns are extremely strong and can stand and nurse (drink the mother’s milk) within a few minutes of birth. Lambs are generally weaned at 2-3 months. Nearly all males and some females born at the Zoo are sold to market in the fall after weaning. Shetland sheep love attention. They sometimes wag their tails when petted. One pound of sheep’s wool can produce as much as 10 miles of yarn! Ring shawls are shawls made from the finest Shetland wool—so fine that the woven shawl can pass through a ring. Both the Shetland sheepdog and Shetland sheep originated in the same place, on the Shetland Islands off the Northeastern coast of Scotland. What’s the difference between lamb and mutton? Only the age of the animal producing the meat. Lamb comes from younger animals, while mutton is from older sheep. Sheep, like dogs, pant when they are hot, but goats lack that ability. Sheep instinctively “follow the leader.” They are social animals that live in flocks. Sheep in a flock will follow the lead of a dominant animal, even if that means running off a cliff.